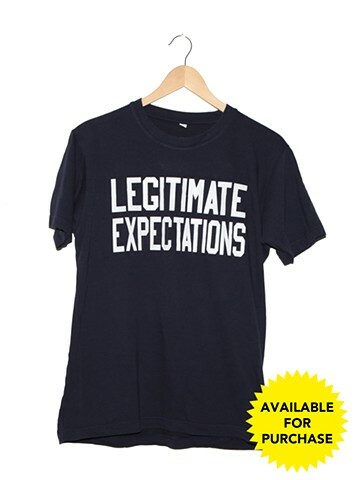 LEGITIMATE EXPECTATIONS is available for purchase in an open print-run. Purchase includes shirt, printing and shipping within the United States. Shirts are sourced from Uniqlo and printed in New York City. For special inquiries, please contact the artist. Due to printing costs, all purchases are final. For Uniqlo's corporate standards click here. For a critique of Uniqlo's labor practices and social responsibility click here. For a detailed report on labor conditions click here. All selection and shipping details will be coordinated via email after PayPal payment is received.